Freedmen is one of the terms given to emancipated slaves and their descendants after slavery was abolished in the United States following the American Civil War. In this context, “Cherokee Freedmen” refers to the African-American men and women who were formerly slaves of the Cherokee before and after removal to Indian Territory. It includes the descendants of the former slaves, as well as those born in unions between formerly enslaved or enslaved African Americans and Cherokee tribal members. During the American Civil War, the Cherokee who supported the Union abolished the practice of African slavery by act of the Cherokee National Council in 1863. The Cherokee Freedmen became citizens of the Cherokee Nation in accordance with a treaty made with the United States government a year after the Civil War ended. After their emancipation and subsequent citizenship, the Cherokee Freedmen and their descendants had to struggle to be accepted as a legitimate part of the Cherokee Nation. Some Freedmen have been active in the tribe, voted in elections, ran businesses, attended Cherokee stomp dances, knew Cherokee traditions and folklore, knew the Cherokee language, and served on the tribal council, with several holding district seats. In the early 1980s, the Cherokee Nation administration amended citizenship rules to require direct descent from an ancestor listed as “Cherokee by Blood” on the Dawes Rolls. The change stripped descendants of the Cherokee Freedmen of citizenship and voting rights unless they satisfied this new criterion. About 25,000 Freedmen were excluded from the tribe. The controversy surrounding the Freedmen’s tribal status and right continues today. You can read more about the dispute here. There were two separate rolls or schedules taken of the Cherokee Freedmen which have been extracted today for surnames. The digitized document is a schedule of names of Cherokee freedmen created by Special Agent John W. Wallace. Individuals on the schedule were entitled to share with the Shawnee and Delaware in the per capita distribution of $75,000, appropriated by Congress in October 1888, and issued under the supervision of his office. These records are held by NARA’s Textual Archives Service Division Old Military and Civilian Records Unit (Washington, DC). Census of the Freedmen and their descendants of the Cherokee Nation taken by the Commission appointed in the case of Moses Whitmire, Trustee of the Freedmen of the Cherokee Nation versus the Cherokee Nation and the United States in the Court of Claims at Washington, D.C; the said commission being appointed by the Secretary of the Interior, and Composed of William Clifton, William P. Thompson and Robert H. Kern, this roll being made from the testimony taken before said Commission in the Cherokee nation between May 4th and August, 10, 1896, in accordance with the provisions made and entered in the final decree of record in the above cause. 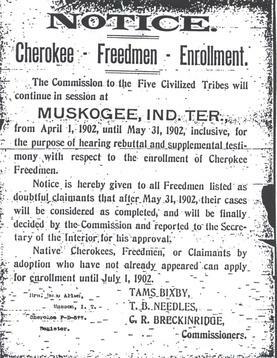 Second, Contesting Freedmen and their Descendants found by this Commission entitled to be enrolled as citizens of the Cherokee Nation, and to share in the distribution of funds found in said decree. You can read more about the rolls and land records here and find further history here. I’ve removed your personal information so you don’t receive unwanted contacts. On the main page of this blog is a search field. Enter the words “5 civilized” and you will get a list of articles with resources. I would suggest you begin by calling the tribe and asking for their requirements and then asking if your Cherokee grandparents was on the roll. Nation Freemen Roll”, Dawes Roll #, birth certificate of her dad, and death certificate of her paternal grandmother that is named on the C.N.F.R. What are our next steps? Thank you for your help.